My friends Alba and Eulices asked me to be the godfather for their son Kuss Bryan, who was baptized on December 8 (photo below). It was a joy and an honor to become part of their family that day. Alba is an amazingly strong and resilient person. Her left shoulder was shattered in the bombing of Santo Domingo in December 1998 when she was 16 years old, her father was killed by FARC guerrillas in March 2006, and her spouse Eulices was imprisoned during the mass arrest in Fortul in August 2006. Residents of Santo Domingo were holding a bazaar on December 13, 1998 to raise funds for their community. Planes and helicopters began circling overhead and the people gathered on the highway that runs through town, waving white cloths to indicate that they were civilians. Two cluster bombs were dropped alongside the highway – killing 17 people (including seven children) and wounding 25 others. Yesterday was the commemoration of the tenth anniversary of the bombing. Shrapnel from the bombs tore into Alba’s shoulder and into the right leg of her sister, Xiomara. As we sat in their kitchen after the baptism, they began talking about that day. “We’re lucky to be alive” said Alba. Xiomara then showed me the large scar on her upper leg. The cluster bombs were manufactured in the U.S. and the coordinates for the bombing were given by U.S. crew members operating a surveillance plane for AirScan. Occidental Petroleum (based in Los Angeles) contracted AirScan (based in Florida) to provide security for the pipeline that transports oil from Occidental’s Cano Limon oilfield in the state of Arauca to the Caribbean coast. I found myself thinking about those connections as I looked at the scar on Xiomara’s leg. I met Wilson my first day here in Saravena in June 2004. I was impressed by his soft-spoken manner and deep commitment to his community. He told me what had happened to Alba and Xiomara, and it was obvious that he loved them both very much. Two years later, on March 22, 2006, Wilson was killed by the FARC. As Alba and Xiomara talked to me about their father, tears welled up in their eyes. Alba gave birth to her first child, Kuss, on December 1, 2005. Eight months later, Eulices was arrested along with 15 other people in Fortul. I met Eulices in Arauca City when I traveled there with a human rights lawyer, two days after the arrests, to visit the prisoners. I met Alba two weeks later when she came to the Joel Sierra Human Rights Foundation office in Saravena to discuss his case. Eulices was charged with rebellion and terrorism, and the prosecutor’s office alleged that he was an ELN militia member and recruiting for the FARC – not a very plausible accusation given the fight between those two guerrilla groups in Arauca. He was in prison on Kuss’ first birthday and he was finally released on June 9, 2007. My friend Carlos Cabrera was killed in Arauquita on November 28. He was forcibly removed from his home, taken to the outskirts of town, and then shot and killed. He was the secretary general of the Arauquita Displaced Persons Association, which represents people who have been forced to flee from their homes because of the violence. He had a spouse and two young daughters, and it appears that he was killed by ELN guerrillas. The situation here in the state of Arauca is deteriorating rapidly. The week before Carlos was killed, an explosive was set off in the entrance of the social organizations building in Saravena – shattering windows on the first and second floors. A fragmentation grenade was thrown over the front gate of the Saravena Community Water Company on November 25 – causing slight damage to the exterior of the building. Eight people were killed, and two people were wounded, between November 23 and 29 in Arauca (total population is less than 300,000 people). The two guerrilla groups in Arauca (FARC and ELN) have been fighting against each other for the past three years, and that conflict is worsening. Both groups have targeted civilians that they view as supporting the other side. Hundreds of people have been killed and thousands have had to flee from their homes in the countryside. I traveled in a bus filled with Carlos’ friends from Arauquita to Fortul for the wake and funeral on November 30. I met his spouse Luz Mila and their two daughters – Luz Linney (8 years old) and Clara Lisbet (3 years old). I was overwhelmed by the intelligence and insight of Luz Linney. She came up to me and very politely asked if she could ask me a question. She wanted to know where I was from and I responded by asking if it looked to her like I was from Colombia – which elicited a smile and laughter. She asked me later on why I was taking so many photos and if I was a reporter. I told her that I’m somewhat like a reporter in that I send reports to people in the United States about life here in Arauca. The next day, she sat down next to me and said, “Yesterday was hard. Today is better...How have things been going for you?” She then asked if people in Colombia receive my reports. She has relatives in Bogotá who weren’t able to attend the funeral and she was concerned that they would see the photos. “If they see the photos, they’ll be very sad,” she told me. She then asked to see the photos. Some of the images reflect intense pain and sadness, and at one point I told her we could look at the photos some other time. “Let’s keep going,” she replied. After we looked at all the photos, she said “You didn’t get a photo of my uncle when he was crying so hard.” I replied that I try to take a few photos that show people’s emotions but I also try to respect their privacy (a balance that is difficult to achieve). She seemed to understand because she said, “Some of the photos are sad, some are happy, and some are neither one nor the other.” We then looked at a few of the photos in reverse order as she told me which were sad, happy, or neither one. The conversation with Luz Linney took place in the home of Maria Ruth (where I stay in Arauquita). Maria Ruth and Carlos were close friends, and she is very concerned that she and her spouse Armando could also be targeted by the ELN. 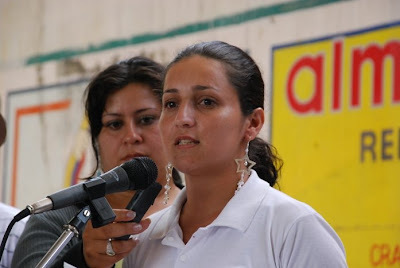 Maria Ruth is the Arauquita representative of the Permanent Committee for the Defense of Human Rights, a member of the Arauquita municipal council, and a leader of the Democratic Alternative Pole opposition party. She traveled to Montana and the Northwest for a speaking tour in April. Maria Ruth and her family will be leaving Arauca for a while because of the increasing threat against them. Last night at 8:35 P.M., an explosive was set-off in the entrance of the social organizations building where I live in Saravena. No one was hurt but windows were shattered on the first and second floors of the building (see attached photos). I was in Arau quita at the time and I returned here early this morning. The explosive didn't contain any shrapnel and it appears that the intention was to scare and intimidate us, rather than hurt anyone. Leaders of the social organizations that operate in the building believe that the explosive was set-off either by a FARC guerrilla or a government agent. The guerrillas of the FARC (Revolutionary Armed Forces of Colombia) and the ELN (National Army of Liberation) have been fighting against each other for the past three years here in the state of Arauca. Both groups profess to be fighting against the Colombian government to achieve social justice, but their conflict in Arauca is solely about the control of territory and economic resources. In addition to killing each other, the FARC and ELN have also been operating like death squads in Arauca; displacing and killing civilians that they view as supporting the other side. They've also created a situation in which anyone could take action (set-off an explosive or kill someone) and make it look like it was part of the fight between the two groups. The social organizations building is located in the center of Saravena, one-and-a-half blocks from a police guard post, two-and-a-half blocks from another guard post, and just four blocks from the police station. The various social organizations have written public denunciations about the explosion and are determined to continue forward with their non-violent struggle for social justice. I'll be moving to a room on the third floor later today, further away from the street and with bulletproof glass. More than 500 people participated in a mass and march in Arauquita on November 11 in protest of the mass arrest that occurred there the week before. Fourteen people were arrested for "rebellion" on November 4 including Martin Sandoval, president of the Permanent Committee for the Defense of Human Rights (CPDH). The March for Freedom and Dignity began with a mass in the central park. The young priest that welcomed people to the event talked about the need to speak out against the unjust arrests and to overcome the fear that people are feeling now in Arauquita. "It is legitimate to resist any authority that gravely and repeatedly violates the principles of natural law," stated the other priest during the homily. He also spoke out about "the many problems that this system of brutal capitalism has caused for us." Ingrid stepped onto the stage with her son Christian in her arms after the mass (see attached photo). Her spouse, Jose, was arrested for "rebellion" during the previous mass arrest in Arauquita on January 12. Christian was born three months later on April 21. Ingrid told me "the environment in the Arauca City prison is very oppressive" and, because of that, she has only taken Christian there twice to see his father. Martin wrote a letter from prison that was read before the start of the march. "If having an opinion that differs with the government, and denouncing the abuses that are committed in the name of law and justice is a crime; then they should convict me. But because they don't have any valid arguments, they will continue using all their tricks to convert lies into absurd truths which not even they, themselves, believe...If we all remain silent; the next victim could be you, a family member, or a good friend." The people then marched through the main streets of Arauquita, passing in front of the police station where the 14 people had been taken the week before. Several families carried placards with photos of their loved ones, calling for their immediate relea se (see attached photo). I accompanied CPDH leaders a few days later when they visited Martin and the others in the Arauca City prison on November 15. Martin told us that he knew the risks he was facing for defending human rights in the state of Arauca and that he had been prepared psychologically for the likelihood of being imprisoned. "This is a beautiful experience," he said. "We share everything with each other here." Martin also stated that the march in Arauquita "inspires us to keep going forward." Guillermo Diaz is the president of the Afro-Colombian association and treasurer of the Laborers' union in Arauquita. He told me that he has five daughters - including a 2-year-old and a 3-year-old that he and his wife adopted as orphans. The police came to their house at 5:40 A.M. on November 4. He was handcuffed and taken away to the police station, and wasn't shown an arrest order until two hours later. Guillermo was the sole source of income for the family. Yilmar Mina is a leader of the search and rescue team and a member of the Assembly of God church in Arauquita. The police called him to the station on November 4 with the pretext that they were going to give him radios for the team. When he arrived there at 5:45 P.M. he was arrested. Yilmar and his wife, Lisbeth, have three young children. Martin told us, "We're paying the price for the public hearing and the visit to the prison." CPDH helped organize the public hearing of the House of Representatives human rights commission in Arauquita on July 31 and also organized a fiesta for the inmates of the Arauca City prison on October 10. My friend, Martin Sandoval, was arrested along with 13 other people here in the town of Arauquita on November 4. He began a hunger strike the following day in protest of those arrests. Martin is the president of the Permanent Committee for the Defense of Human Rights in the state of Arauca. He has consistently spoken out against the human rights violations committed by the Colombian government in the state – including mass arrests and the killing of civilians who are then reported as guerrillas killed in combat. He has also forcefully denounced the abuses committed against the civilian population by the FARC and ELN guerrillas in their fight against each other in Arauca. Martin was arrested just four days after the United Nations High Commissioner for Human Rights, Navi Pillay, met with human rights activists in Arauca to discuss the difficult situation that they’re confronting in their work. The arrest also occurred just four weeks after the United Nations working group on arbitrary arrests visited Arauca to investigate the mass arrests that have taken place in the state. The Permanent Committee for the Defense of Human Rights organized a fiesta in the Arauca City prison on October 10 – to provide solidarity for the prisoners and lift their spirits for a few hours. Martin greeted the inmates on behalf of the Committee (see attached photo). He is currently being held in the Arauca City police station and will probably be entering the prison again soon – although, this time, not as a visitor. The Committee also helped organize a public hearing of the House of Representatives human rights commission in Arauquita on July 31 which was attended by more than 500 people. Martin and other community leaders denounced the persistent violation of human rights in Arauca. The leaders of the Committee believe that his arrest is due, in part, to retaliation for that hearing. Maria Ruth Sanabria is the Arauquita representative for the Committee, and I organized her Montana and Northwest U.S. speaking tour in April. She called me on November 4 and said “I have bad news for you, my son, Martin has just been arrested,” as her voice began to break. I arrived in Arauquita two hours later and went to the police station to enquire about Martin. The police commander told me that I couldn’t enter at that moment, but I could come back in 20 minutes at noon. When I returned shortly after noon, the prisoners were being loaded into a truck and were then taken to the Arauquita military base. We arrived at the base in time to see the helicopter land that, a few minutes later, took the prisoners away to the 18th Military Brigade headquarters in Arauca City. Martin and the others are charged with rebellion, conspiracy and terrorism. The primary “evidence” in many of the previous mass arrests in Arauca has been the testimony of supposed former guerrillas that receive compensation for their collaboration. Guillermo Diaz was one of the 13 people arrested along with Martin. Guillermo is the treasurer of the Laborer’s union and president of the Afro-Colombian association in Arauquita. Jose Ortiz, a young man who is studying accounting in the National Training Institute, was also arrested. José was the only source of financial support for his elderly mother. Reynel Cifuentes and Olegario Araque, who both have disabilities, were also among those arrested. The news on the day of the arrests was dominated by the U.S. elections. Our friends from Arauquita, including Martin, want to believe that Barack Obama will represent a change from the policies of George W. Bush, and Bill Clinton. 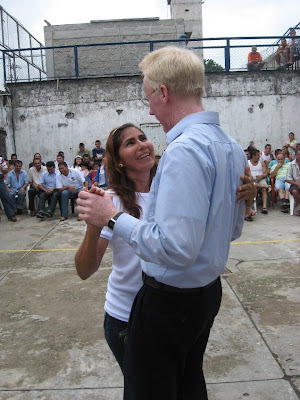 I went to a great party in the Arauca City prison on October 10. The Permanent Committee for the Defense of Human Rights organized the fiesta to provide solidarity for the prisoners and lift their spirits for a few hours. More than 60 people traveled to the prison from Arauquita – including two very-talented high school dance troupes and two great musical groups. Packages of food and personal items were delivered to the 87 prisoners from Arauquita, who then decided to share those amongst all the 286 inmates of the prison. Mejia, the MC, organized an impromptu dance contest with the five female prisoners at the party – partnering them with five of their male colleagues. After the contest, the dancers grabbed other partners from the crowd and the party kicked into high gear! Mejia danced with one of the prisoners and then called me out to finish the song (see attached photo). Later on, we sat down to talk and she told me about her experiences. Flor was the board secretary of the Arauca Peasant Association and she told me “I continue defending human rights and I’m paying the price for that.” She was detained by the secret police (DAS) when she was in Arauca City on February 14, 2006 for a medical appointment. The police didn’t present her with an arrest order until two hours later. Marcela, Flor’s oldest daughter, was 18 years old when her mother was imprisoned. She suddenly had to assume the responsibility of taking care of her three siblings – Viviana, who was 8 years-old; Fernando, 11; and Edwin, 14. The four of them have occasionally gone hungry, but they’ve stayed together as a family. As a single mother, Flor requested that she be granted house arrest so that she could care for her children. That request was denied because she was considered to be a danger to society and to her own children. Flor’s trial on January 23, 2007 lasted for 15 minutes. None of the six witnesses that testified during the investigation appeared in court. The judge left the courtroom before the trial began and the prosecutor declared her to be guilty of rebellion. Flor worked as a rural health promoter for 14 years and she’s continuing that work by caring for the health of the other inmates. She’s also continuing her role as a catechist. “In these circumstances if you’re not spiritually strong, you’ll fall apart,” she said. Her primary concern is the violation of children’s rights, including those of her own children – the right to be with their mother and to not suffer from hunger. Flor was very glad to hear that the Arauca Peasant Association is continuing its work in spite of the repression against the organization. Luz Perly Cordoba, the founding president, spent a year in prison for rebellion and is now living in exile. An arrest order was issued for the second president last year, and another member of the board was imprisoned for rebellion in January. “There’s nothing else to do but to cry and to keep going forward,” Flor concluded. “This is the best gift that God could give me: bringing Nelson here today,” said Rosa on August 22. It was Rosa’s birthday and she was spending the afternoon in Saravena circuit court at the preliminary hearing for her son, Nelson Prieto. Nelson is a leader of the health workers union in Saravena who was arrested for “rebellion” on July 17, 2007 and imprisoned in Arauca City. He was brought to Saravena for the hearing. I met Nelson during the commemoration of the first anniversary of the killing of his father, Jorge Prieto, and two other community leaders - Alirio Martinez and Leonel Goyeneche. The three men were executed by the military in the community of Caño Seco on August 5, 2004. Nelson had been arrested previously for rebellion on November 12, 2002 during the first mass arrest in Saravena. More than 2,000 people were rounded up by the military and police that morning and taken to the sports arena. They were forced to walk past a truck in which two informants pointed out the people to be detained. Nelson and 42 others were charged with rebellion and imprisoned in Bogotá. He spent 15 months in prison before being granted conditional release. Carmen, Nelson’s spouse, told me that she would take the 5 A.M. bus on Saturday from Saravena to Bogotá – a 12 hour trip. She would spend Saturday night on the sidewalk in front of the La Picota prison in order to visit Nelson on Sunday – the day for women to visit the prisons in Colombia. Carmen now leaves Saravena at 2:30 A.M. on Sunday to get in line outside the Arauca City prison by 5 A.M. Yajaira (9 years old) and Sebastian (11 years old), their two children, travel to the prison every three months to visit their father. The last time they had seen Nelson was on May 25 and they were very happy to be with their father again in court. The judge in the first case declared Nelson and the others to be innocent in 2006. That decision was appealed by the prosecutor. The Bogotá superior court upheld the innocent verdict last month and disqualified the testimony of the witnesses in the case. Nelson is now in prison for the same crime for which two courts have declared him to be innocent. The “evidence” against him is the testimony of the same witness from the first case. 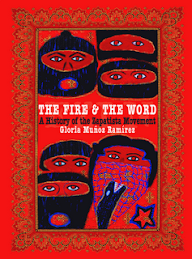 That witness claims to be a former guerrilla, and he entered a government demobilization program in 2003. He states that he attended a meeting of guerrilla commanders in which Nelson was present in 2005 – two years after entering the government program. The “investigation” against Nelson was carried out by the Support Unit of the prosecutor’s office based in the 18th military brigade headquarters in Arauca City. That unit was established in 2001 to investigate cases of “terrorism” – specifically defined as attacks against the pipeline that transports oil from Occidental Petroleum’s oilfield in Arauca to the Caribbean coast for shipment to the U.S. Nelson is charged with rebellion, not terrorism. Nelson’s lawyers requested that the case be dismissed because he’s already been tried for this same crime and the Support Unit doesn’t have the authority to investigate cases other than terrorism. The prosecutor even agreed with them in relation to being tried twice for the same crime. Nelson’s lawyers also requested that if the case were to continue, that he be granted house arrest. The judge ignored the concerns of the defense and the prosecutor, and denied the motions to dismiss the case and the request for house arrest. P.S. I will be in the U.S. and Canada during September for my annual pilgrimage to the Canadian Rockies. The week of September 15, I’ll be speaking in United Church of Christ congregations in Montana – Billings, Red Lodge, Big Timber, Bozeman, Butte and Missoula. If you’d like to attend one of those presentations, please let me know and I’ll send you the date, time and location. The police intelligence agent was aiming through the gun slot of the guard post at the people who were marching through Saravena on August 5. He was crouched down below the bullet-proof glass window and was photographing the people that were commemorating the fourth anniversary of the killing of three beloved community leaders. An army truck then rushed to the front of the march and several soldiers jumped out with automatic rifles. One of the soldiers was also armed with a camera and he started taking photos, as well. Two soldiers on motorcycles rode through the people at the front of the march and then roared away. More than a thousand people marched along the main streets of Saravena that day in the subversive act of honoring the memory of Alirio Martinez, Leonel Goyeneche and Jorge Prieto. During the early morning of August 5, 2004, soldiers took the three men out of Jorge’s home in Caño Seco and executed them. Vice President Santos and Defense Minister Uribe said that the men were guerrillas who had shot at the soldiers, and the soldiers then shot back in self-defense. Alirio was the president of the state Peasant Association, Leonel was the director of an alternative adult high school in Saravena, and Jorge was the president of the Saravena health workers union. A “memory gallery” was created in front of the social organizations’ building in Saravena on August 4 (see attached photo). Three banners were hung from the second floor with the names of Alirio, Leonel and Jorge. 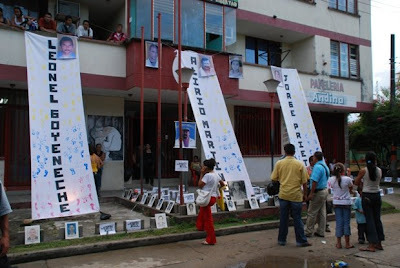 Photos of people who had been killed by the government security forces and the right-wing paramilitaries were then placed in front of the building. Hundreds of people gathered together that evening to honor the victims of government violence in the state of Arauca. During a very moving ceremony, candles and flowers were placed by the photos, people held hands in a moment of silence, and then joined together in applause. Three of the family members then spoke in honor of their loved ones. Aide was 21-years-old when her father, Alirio, was killed. The last time she saw him alive was in January 2003 when she left Colombia to attend medical school in Cuba. She had decided to follow her father’s example of service to the community by studying to become a doctor. She is now in her sixth year of medical school and will graduate next year. Abdon Goyeneche is a teacher, like his brother Leonel. He talked about his brother and he also described being arrested shortly after the second anniversary of the killing in 2006. Abdon was charged with “rebellion” and spent ten months in prison. 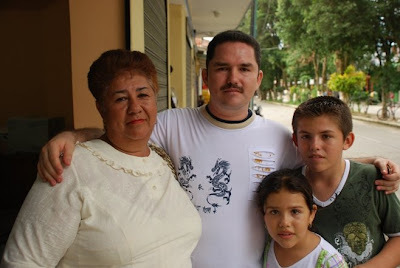 Luis Ernesto Goyeneche, another brother, was arrested for “rebellion” in December 2006 and is still in prison in Arauca City. Cesar Prieto came up to the stage with his niece, one of Jorge’s daughters. Jorge’s son, Nelson, spoke during the first anniversary of the killing but was unable to attend this year. 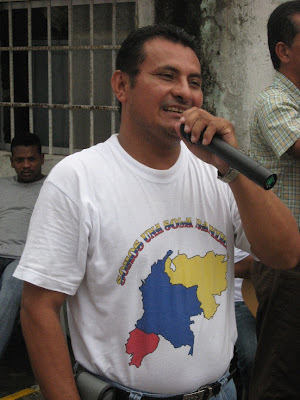 Nelson was a leader of the Saravena health workers union, and he was arrested for “rebellion” in February 2007 and is still in prison in Arauca City. One of the slogans of the social movement here is “Arauca exists, insists, and resists!” Honoring the memory of Alirio, Leonel and Jorge was a powerful expression of that resistance. 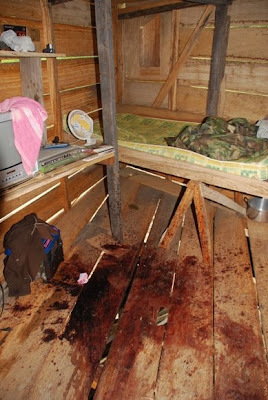 Aicardo Ortiz was shot to death inside his home by members of the Calibio Battalion at approximately 5:30 A.M. on July 8. Aicardo was 58 years old and suffered health problems. The army reported him as a guerrilla who had been killed in combat. I was visiting the Christian Peacemaker Team (CPT) in the city of Barrancabermeja that week and we were asked by the Cimitarra River Valley Peasant Association to accompany a mission to Aicardo’s house on July 10. The mission included a representative of the presidential human rights office, five investigators from the prosecutor’s office, and two non-governmental human rights lawyers. 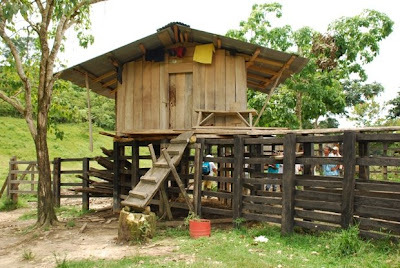 Aicardo lived in a ten foot by ten foot wood structure above a small corral a few miles from the community of San Francisco. The investigators spent more than three hours analyzing the scene and then some of us were allowed to enter the house. When I got to the doorway, I saw the large stain on the floor (two photos of Aicardo’s house are attached, although you may prefer not to view the second image of the inside of the house). When members of the community arrived at the house after the killing, Aicardo’s body was laying on the ground outside. Either Aicardo had somehow been able to get off the floor and make his way down the steps after losing so much blood, or his body had been moved from the house. Initially, there were also a two-way radio, grenade and revolver by the body. Similar items have been planted by soldiers in previous cases of what are called here “extrajudicial executions” or “false positives.” In this case, the radio was later removed by one of the soldiers, and the grenade was removed and detonated allegedly for safety concerns. The Calibio Battalion is utilizing four informants from San Francisco who apparently told the soldiers there were three guerrillas in Aicardo’s house. When Aicardo didn’t open the door for the soldiers that morning, they forced it open and shot him. When we returned to San Francisco, Lieutenant Florez had a brief and very tense meeting with the community. He had been in charge of the operation on July 8, and he stated that everything was done legally and there had been an exchange of gunfire. The president has put pressure on the military to “show results” and national and international human rights organizations have repeatedly expressed concern about extrajudicial executions in Colombia. 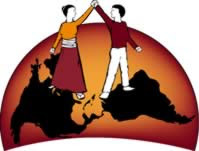 “The international accompaniment (of the mission) was very valuable and it encourages people to speak out” said Carlos, regional coordinator of the peasant association. “The people feel strong and protected, and we’d like to have continuous accompaniment” added Evaristo, another leader of the association. 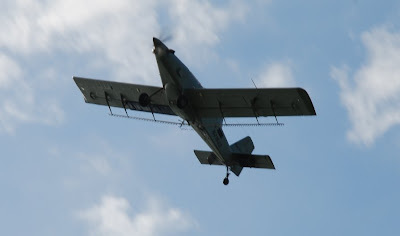 One of the planes flew directly overhead - in the photo you can see the tubing attached to the wing that is used for the fumigation. The plane was escorted by two helicopters which each had machine guns pointing out of both doors. 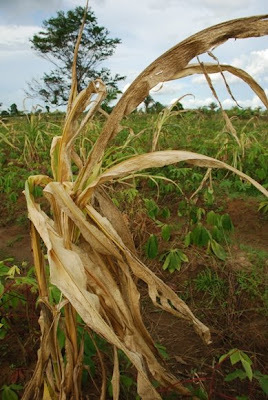 Peasant and human rights organizations have repeatedly denounced that the fumigations damage food crops and human health. On June 25 and 26, I traveled with representatives of the Joel Sierra Human Rights Foundation to visit farms that had been fumigated in the municipality of Arauquita. Luis Alfonso and Amilia have four children and live in a small, dirt-floored, house alongside their field of corn and yuca. They don’t have any coca (the raw material used to manufacture cocaine) but their farm was still fumigated on June 10. The plants have withered and will not produce any harvest (see attached photo). Luis Alfonso borrowed money to plant the crops, and now he won’t be able to pay that money back nor does he know how he’ll be able to provide for the family. The United Nations Office on Drugs and Crime (UNODC) detected approximately 6,700 acres of coca here in the state of Arauca in 2001 (the peak year, according to their figures). Between 2003 and 2007, nearly 60,000 acres were fumigated in the state during five rounds of spraying. The amount of coca detected by the UNODC in Arauca at the end of 2007 was 5,300 acres – the largest amount since 2001. 1. DynCorp, a corporation of retired soldiers and soldiers-for-hire, has the State Department contract for drug eradication and interdiction in Colombia, Bolivia, Peru and Pakistan – with the primary focus being the aerial fumigations in Colombia. DynCorp receives $174 million per year for that contract. 3. Textron manufactures Huey helicopters and received $81 million for the forty two Hueys given to Colombia as part of Plan Colombia. 4. Monsanto manufactures the herbicide glyphosate (Roundup) that has been used to fumigate more than 2.5 million acres in Colombia during the last eight years. According to peasant and human rights organizations in Arauca, the fumigations also benefit the oil corporations by causing people to abandon the rural areas where oil exploration is occurring. Occidental Petroleum (a U.S. corporation), Repsol (a Spanish corporation), and Ecopetrol (a corporation primarily owned by the Colombian government) are currently exploring several new oilfields in Arauca. The peasant organizations in Arauca are calling on the government to halt the fumigations. The peasants have expressed their willingness to manually eradicate the coca in exchange for assistance with alternative crops and marketing that would enable them to provide for their families. In the last two weeks, some of the peasants have already started eradicating even though the government has not agreed to the proposal.